In a testament to the Peru's economic boom, a recent report from the Getúlio Vargas Foundation and Munich University ranked the country the best in the region for business climate. Yet despite its economic success, Peru faces many challenges common throughout Latin America: dependence on commodity exports, social imbalances, poor education system, distrust in institutions, and a lack of indigenous political representation. 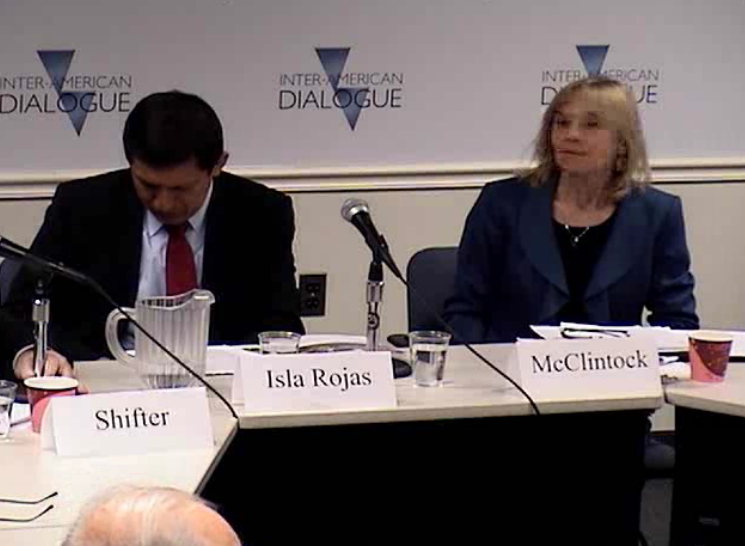 At a roundtable discussion held at the Inter-American Dialogue on February 21, Victor Isla Rojas, president of the Peruvian congress, and Cynthia McClintock, professor of political science at George Washington University, addressed these challenges. "We live in a country of total distrust; to restore it is our country's biggest challenge," said Isla Rojas when diagnosing the most pressing issue in Peruvian democracy. McClintock posited that Peru, the youngest Latin American democracy, scores lowest in the region for citizen approval of institutions like Congress and the Supreme Court. This deep-rooted resentment of the political establishment, says Isla Rojas, has been generated by a track record of politicians that "don't deliver." As such, "cheap talk" must be abolished to rebuild trust in institutions. The panelists both praised President Ollanta Humala, whose election was initially regarded with suspicion in 2011. Many feared anti-business policies could dry out foreign investment and hamper the country's growth prospects McClintock asserted that the president's recent reforms to implement social programs and a minimum salary were steps in the right direction, and Isla Rojas stated the president "does what needs to be done" regarding social inclusion. A pressing challenge is to translate economic growth into social progress. As Isla Rojas depicted the situation in his country, "We received record sums in foreign direct investment but local communities still suffer." In order to pay a "historic debt" to the marginalized countryside, infrastructure and state presence must become policy priorities. A lack of these basic necessities has given rise to drug trafficking, fueled remnants of the Shining Path insurgency, and increased everyday crime. Reconciling sustained growth with environmental concerns and indigenous traditions of land use is another priority, according to the panelists. Isla Rojas argued that the implementation of the "prior consultation" law – which stipulates that companies must consult with indigenous communities before beginning extractive projects – reflects the lessons learned from the "Baguazo", a violent clash of indigenous protesters and state forces that caused more than 50 fatalities in 2009. However, it remains to be seen whether the new law will be a panacea that can reconcile extractive industries with the goals and desires of local communities. On the international agenda, Isla highlighted the importance of continuing Peru's integration into the global economy. In order to achieve this goal, he emphasized the Pacific Alliance – a commitment to common political ideals and the reduction economic barriers between Chile, Colombia, Peru and Mexico – that would create a market of more than 200 million consumers. He also highlighted "Becas 18," a scholarship intended to educate a new generation of "global citizens" by funding study abroad programs.